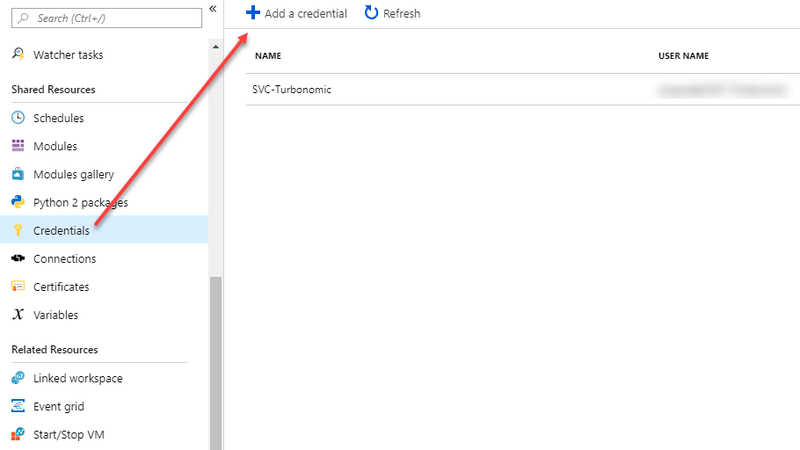 For certain types of actions with Turbonomic, it would be great if we could run PowerCLI scripts directly from Turbonomic as part of the action, either before or after the action is executed by Turbonomic. 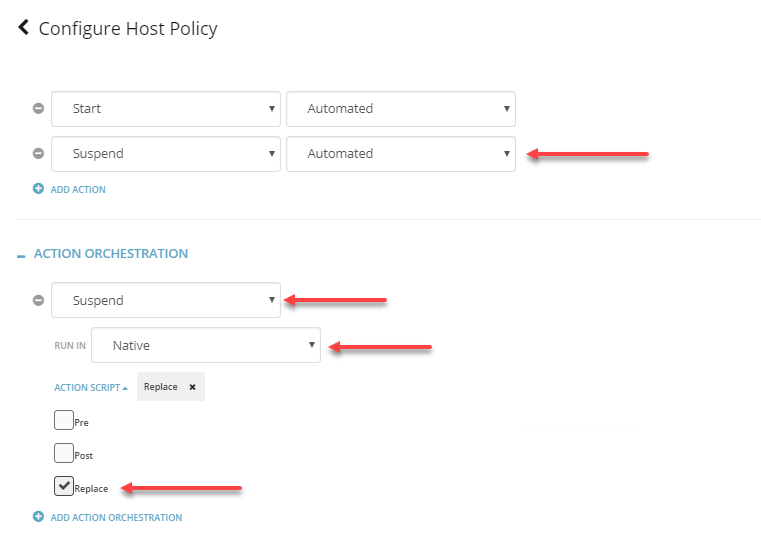 In our scenario, we are using Turbonomic to manage our hosts with a host policy that fully automates ‘Start’ and ‘Suspend’ of a host. This works great, except for one problem: suspending a host in our environment triggers a high priority event to our Hyper-Visor team because the host is no longer responding. What should be an easy problem to resolve with our monitoring team, i.e. creating an action script to notify BMC Patrol that the host being suspended is in fact OK and to not create a P2 ServiceNow incident, turned out to be very difficult because of the fact that their version of BMC Patrol doesn’t support API integration. So, our options were really limited on what we could do to prevent unnecessary high priority incidents. Initially, I had thought about writing a bash script to just have Turbonomic call API’s to the vCenter and put the host in maintenance mode, as opposed to having it suspended. However, I struck out again - I couldn’t find a way to do this with vCenter API directly, but I did find a way to do it with PowerCLI. Here I will describe how I use Azure Automation with PowerCLI to accomplish this. This is a really rare use case, but it might be useful for other functions that PowerCLI is capable of. An AD Account that is used by Turbonomic and has access to your vCenter. Text editor (VSCode, Notepad++, etc). 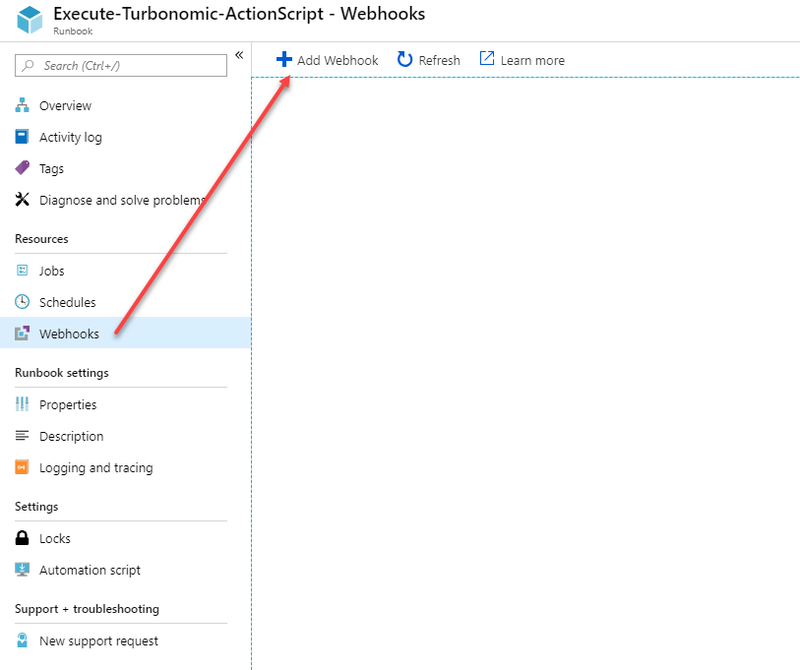 Create a bash script which Turbonomic will execute a CURL command to invoke our Azure webhook. SSH to the Turbonomic appliance. This script can also be used for other executions of PowerCLI, and incorporates a switch statement that checks the script name which was passed from Turbonomic. Example - REPLACE_SUSPEND_PhysicalMachine.sh is passed from Turbonomic as part of the data from the webhookdata. This variable is then read so that we can execute specific actions for each script that calls it. The alternative would be to create separate runbooks + webhooks for each action. I felt this was easier to manage. Write-Output "Took $TurboOutput.TargetName out of maintenance mode." Write-Output "Placed $TurboOutput.TargetName in maintenance mode." Once you’ve written the script, you’ll need to create a runbook. I’ve named my runbook ‘Execute-Turbonomic-ActionScript’ and ensured the type of script is PowerShell. Make sure you copy the webhook URI and store it in a safe and secure place. 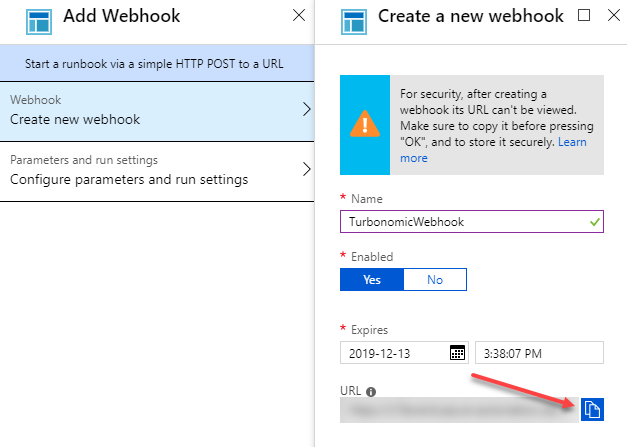 If you lose the URL, you’ll need to create a new webhook! 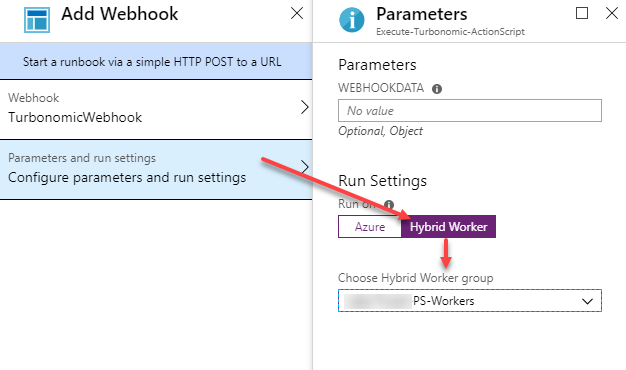 Next, we’re going to configure the Webhook run settings to run on ‘Hybrid Worker’, and we’ll select the Hybrid Worker Group. 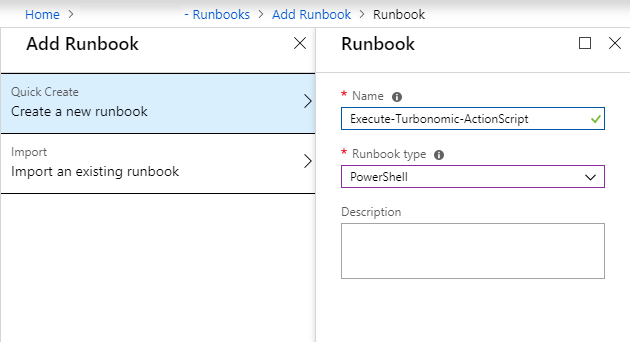 Once you’ve got the runbook and webhook all setup, you’ll need to create a request to invoke it from Turbonomic. 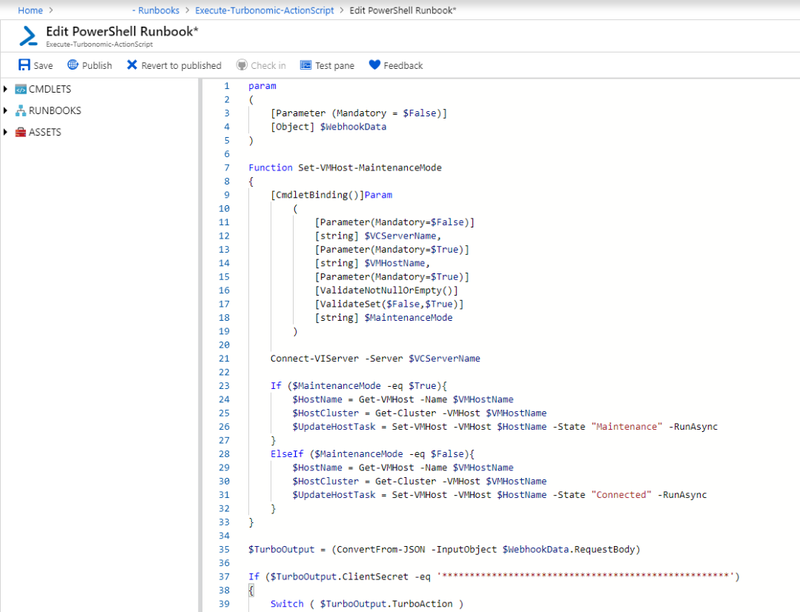 I’ve built the script so that it sends the necessary data from Turbonomic to our PowerShell webhook. Because an Azure webhook is opened to anyone who has the URL, I felt it necessary to add another layer of security, and that is to place a field ‘ClientSecret’ in both my PowerShell script, and my Action Script. That way, if someone does discover the URL, and they knew the name of a physical host, they couldn’t do anything malicious, unless of course they discover our client secret. There might be a better way to secure this, but for now it’s how I’ll be doing it.